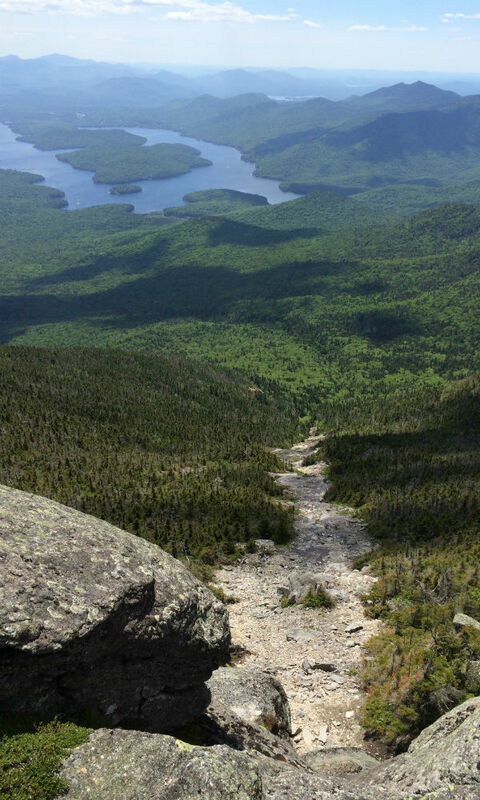 Five more mountains in the Adirondack High Peaks that will get you hooked on hiking. Regardless of what the headline of this story might suggest, by this point—assuming you’ve already completed all the hikes in my first “guide to hiking“—you’re no longer a beginner hiker: You’re in the big leagues now. 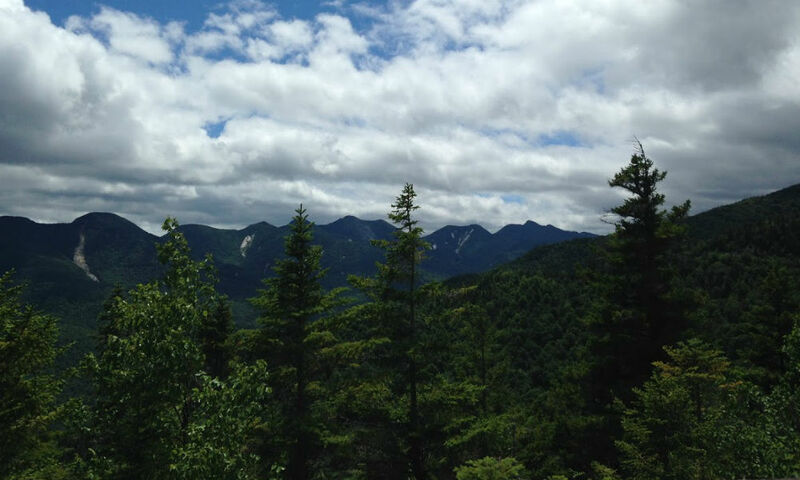 And luckily, the biggest-deal mountains in New York—the Adirondack High Peaks—are right in your own backyard. 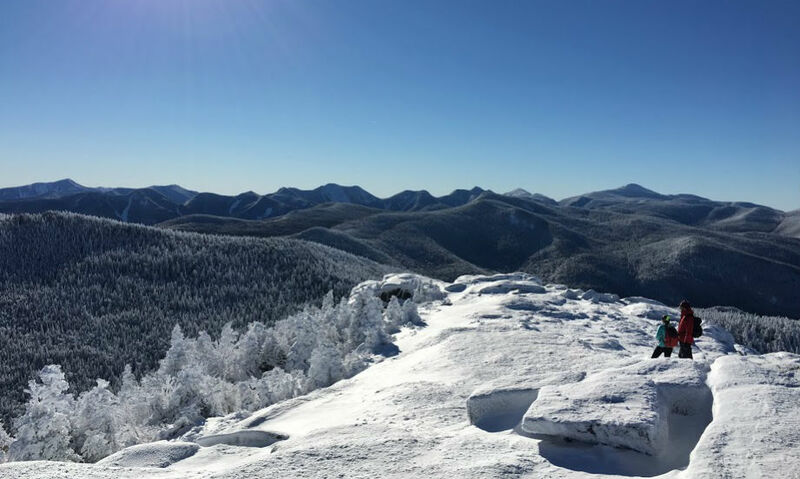 The High Peaks comprise 46 mountains taller than 4,000 feet in the Adirondack Park, and serve up some of the most rugged hikes in the east. Since 1925, more than 10,000 people have registered as “46ers”—climbers who’ve completed all 46 high peaks—and thousands more consider themselves “aspiring 46ers.” In fact, I don’t know of anyone who’s hiked even one of the peaks and not made it a goal to hike them all. So instead of treating these five hikes as a beginner’s guide, think of them as the beginning of your imminent fixation on becoming a certified 46er. Though not technically a high peak—it measures in at 3,556 feet—Noonmark’s a hike you don’t want to miss. (Technically, four of the actual High Peaks shouldn’t be high peaks, since they’re below 4,000 feet, and MacNoughton Mountain, which isn’t one of the 46, should be. When the High Peaks were established, the surveying equipment wasn’t exactly precise.) 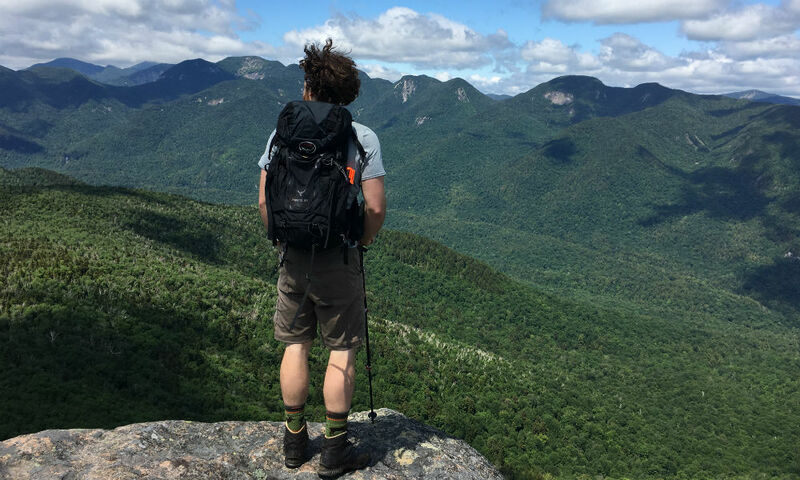 Noonmark, the crown jewel of Keene Valley, NY, may not have made it into the 46 highest Adirondack peaks club, but the views from the top are some of the best in the park. From the rocky summit, you get panoramic views, but the best view of all is of the Great Range, a series of mountains comprised of the Upper and Lower Wolfjaw, Armstrong, Gothics, Saddleback, Basin, Marcy and Haystack, to the Northwest. The second-best view? When you’re back in your car driving into Keene Valley, and you catch a glimpse of the Noonmark Diner! Take Exit 30 off the Northway and go left on Rt. 73. Before you get to Keene Valley, take a left onto Ausable Club Road and park. Walk up Ausable Club Road, and just when you get to the golf course, turn left at the Noonmark trailhead. Follow the gravel road six-tenths of a mile and turn right onto the Stimson trail, which you’ll follow all the way up to Noonmark’s summit. Noonmark’s my go-to backup plan. When my boyfriend and I drove to Elk Lake to hike a few mountains in the Dix range and found the two-mile road to the trailhead closed, we turned around and headed to Noonmark—a shorter hike we were sure to finish before dark. But here’s a tip: leave your mom (if she isn’t an avid hiker) at home. After Noonmark, mine spent three days in a recliner, and never hiked again. Cascade is widely accepted as the easiest of the High Peaks and has one of the best summits (another 360-degree view). Therefore, it’s the most frequently hiked. It’s also popular, because it can be hiked with another High Peak—Porter Mountain—the summit of which is only a mile and a half from the summit of Cascade. And unlike most of the other peaks, the summit of Cascade is visible from the parking area, so after your hike, you can see just how far you’ve come. Instead of turning into the Ausable Club like you did for Noonmark, continue on Rt. 73 through Keene Valley. At the fork in Keene, keep right on 73, and about five miles from there, you’ll see the trailhead on your left. The only parking is on 73, and during peak hiking seasons, you may not be able to get too close to the trail. The red-marked trail is easy to follow, and three-tenths of a mile from the summit, you’ll come to the intersection to Porter. If you’re still feeling good, try to hit both peaks! Go when no one else wants to go: The coldest day of the year! The last time I hiked Cascade, it was negative three degrees at the summit. We weren’t able to have a picnic lunch, but we didn’t have to deal with the crowds that swarm the mountain in the summer and fall. And, we got to park right next to the trailhead. Just make sure you wear layers! Giant is another popular mountain for first-time High Peaks hikers. But don’t be fooled by the number of cars in the parking lot: This is not a hike for the faint of cardiovascular endurance. At almost 1,000 feet gained per mile hiked, the trek is straight up, straight from the trailhead. There’s a reason I’ve hiked it five times, though—there’s no mountain in New York that gets you that high (vertically), that quickly. This is an easy one (which is part of the reason it’s such a popular hike). The Giant trailhead is about seven miles off Exit 23 on Rt. 73, just before the Ausable Club across from Chapel Pond. The trail is an easy one, too; the one trail brings you directly to the summit. You’ll know you’re almost there when you pass the trail over to Rocky Peak Ridge. More on that next. If you’re looking for a six-mile hike, follow the directions above. If you’re looking for a hike almost twice as long but at least twice as scenic—and you have two cars—pair Giant with Rocky Peak Ridge. The entire ridge trail is 11 miles, and there’s some dispute as to what the best direction from which to hike it is. Starting at Giant is probably easier, but doing so at the Rocky Peak Ridge trailhead on Rt. 9 south of New Russia is more rewarding: You have to work for increasingly awesome views. Park one car at one trailhead and drive to the other. After the hike, you can drive back to the other car. And if you don’t have two cars, you can wing it like my dad and I did. Find someone to switch keys with somewhere on the ridge trail, and drive their car back to your car when you get to the bottom. Big Slide’s another great hike that you have options for. 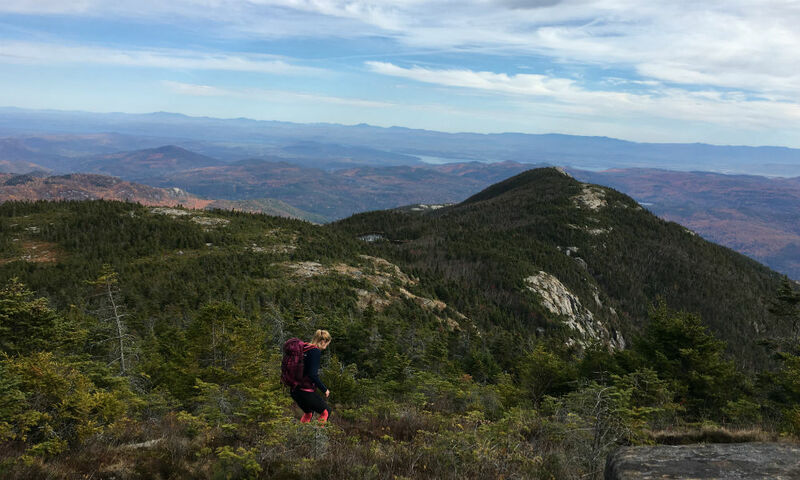 The 7.2-mile round trip hike is an out-and-back hike, starting from The Garden trailhead in Keene Valley and ascending The Brothers, a collection of rock ledges, to the summit of Big Slide. You also have the option to make the hike a 10.9-mile loop by climbing up The Brothers to Big Slide, continuing along the ridge trail to Yard Mountain (a 4,000-foot peak not included in the 46 High Peaks because of its proximity to Big Slide), descending from Yard to Johns Brook Lodge and hiking the 3.4 miles back to your car. Take Exit 23 to Rt. 73 into Keene Valley. At the Keene Valley Ausable Inn, take a left on Adirondack Street, which will turn into Johns Brook Lane. The Garden is at the end of this road. The parking lot is usually packed, and if it’s full, you’ll have to go back down into Keene Valley, take a left, and park at Marcy Field, two miles away, where a bus will pick you up and bring you to The Garden. The bus costs $10 per person, which is a bummer, but it costs $20 per car per day to park at The Garden. Once you get to the trail it gets easy. To do the 7.2-mile hike, follow the signs for The Brothers. You’ll bypass the trail to Porter Mountain, and continue following yellow rock blazes and blue trail markers over the rocky trail until you get to the summit approach. From there, it’s a steep two-tenths of a mile to the summit. I have only one tip: Don’t leave your hiking boots at home! You’ll have to wear the muddy two-sizes-too-big sneakers in the back of your dad’s friend’s car. It won’t be pleasant. 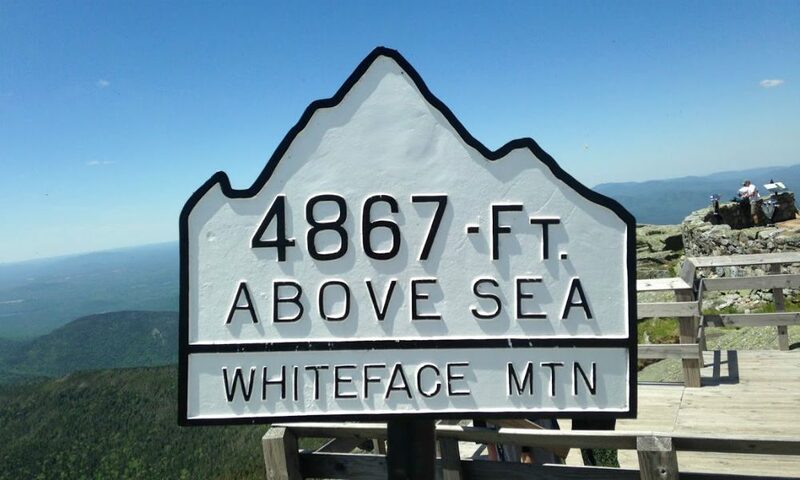 Our last stop is Whiteface Mountain, the fifth-highest High Peak. Whiteface is obviously home to the popular ski area, which boasts the largest vertical descent (3,216 feet) in the east, and the 15th largest in North America. (The hiking trail starts at a higher elevation than the ski area, hence the 2,535 elevation gain.) Whiteface is a popular tourist attraction in the summer for reasons twofold: For one, non-hikers can drive up to the castle, restaurant and gift shop at the summit and not even break a sweat; also, because of its unique location north of the rest of the Adirondack High Peaks, it serves up summit views south over all the other 4,000-footers. Take Exit 23 to Rt. 73 into Keene. At the fork, keep right on Rt. 9N toward Wilmington. Continue into North Jay and keep left on Rt. 12. In Wilmington, turn left on Rt. 431 and then left again on Marble Mountain Rd. The trailhead will be on your left. The hike starts on Marble Mountain, a very steep climb through many marble-like rocks. At the top of Marble, take a right, and continue to the Esther Mountain intersection. (Many people hike Esther, another High Peak, with Whiteface.) Continue straight to the summit, passing by the Whiteface Memorial Highway. If you’re doing this hike for peak-bagging purposes, follow the instructions above. It’s very rewarding taking off your muddy boots in front of ladies in dresses and heels who drove to the summit. But if you’re in this for an awesome ski run down Whiteface, go up the week after the ski mountain closes and skin up the ski trail. You won’t be able to get all the way to the summit, but you’ll get some of the best spring skiing, without the crowds. 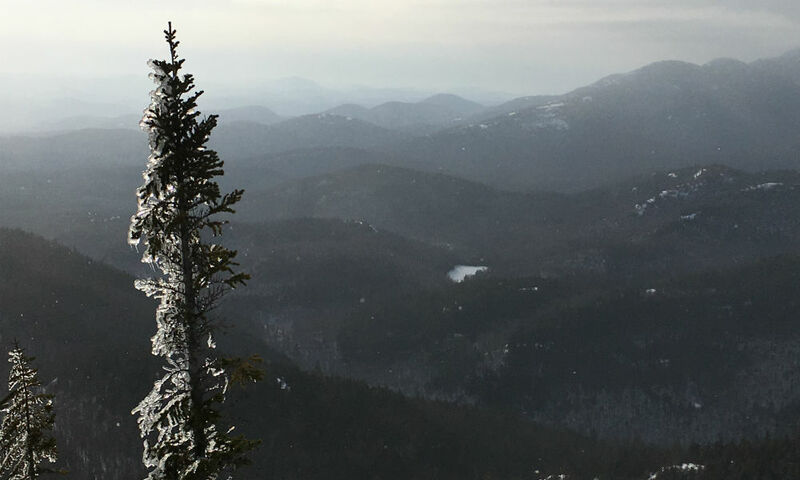 For more on hiking in Upstate New York, visit the Lake Placid Office Of Sustainable Tourism’s website or adirondack46er.org. Happy hiking!